Pre-heat the oven to 400 degrees for the shrimp. Start to prepare the dressing by placing the lime juice, avocado, salt, pepper, water, and Greek yogurt into a blender and blend until smooth. Put it aside to settle. Once the shrimp is prepared (peeled and deveined) place them in a bowl and coat with olive oil, oregano, salt and pepper. Make sure they are coated evenly and transfer them to a cookie sheet. You will bake them at 400 degrees for about 6 minutes until they turn pink. 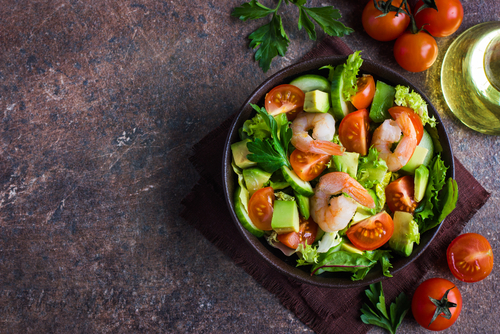 In your final serving bowl, add in the romaine lettuce, chopped bell pepper, halved cherry tomatoes and shrimp. Evenly toss together before adding in the avocado dressing. Once the salad is portioned into small serving bowls, add on the dressing as thin or thick as you would like. Enjoy! I didn’t really care for the oregano shrimp combo and I thought the dressing was somewhat bland. I added cilantro, garlic salt and lemon to the dressing now. I’ll let that chill overnight and see how it is tommorrow. This is my absolute favorite recipe so far. I seasoned up the dressing with pepper, garlic salt, and celery salt….LOVE IT!!! I wouldn’t keep it longer than one week! How long can the avocado dressing last in the fridge?